Cook told cricket correspondent Jonathan Agnew: "I find it quite hard to take to be honest." 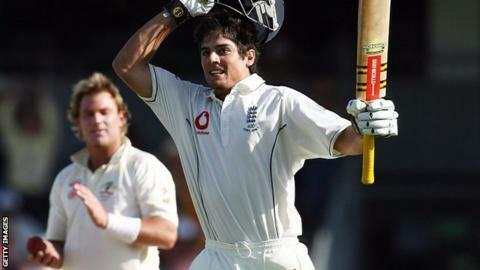 England captain Alastair Cook has called for a crackdown on "personal" attacks on his style of leadership. Cook was criticised for being too cautious during the 5-0 Ashes whitewash by Australia, with Shane Warne suggesting the same trait cost England victory against Sri Lanka on Monday. "Something needs to be done because for three years as England captain I have been criticised," Cook told the BBC. Asked if the criticism was personal, he said: "I think it is, yes." Cook will lead England in the second Test against Sri Lanka at Headingley, starting on Friday. In a pre-match interview with BBC cricket correspondent Jonathan Agnew, he added: "I find it quite hard to take to be honest. Support and positivity is what this England team needs." Cook became England's one-day captain in 2011 and succeeded Andrew Strauss as Test skipper the following year. The Essex opener began his reign by overseeing England's first series win in India in 27 years in December 2012 and retained the Ashes with a 3-0 series victory on home soil in 2013. However, the manner of England's sorry demise down under, when they were heavily beaten in all five Tests, led former players from England and Australia to question Cook's leadership. Former Australia leg-spinner Shane Warne was among Cook's most outspoken critics, repeatedly describing Cook as "boring" and "unimaginative" for setting defensive fields and focusing on building pressure rather than taking risks in the hunt for wickets. This week, Warne said England would have beaten Sri Lanka in the first Test if Cook had declared earlier. England fell one wicket short on a dramatic final day, with Sri Lanka still 189 runs short of a notional 390 target. Cook added: "Yes, when we lose games of cricket as a captain you get criticised, but I've also won a lot of games of cricket for England. "I've won more one-day games as an England captain than anyone. I've won an Ashes, I've won in India away, and that's what I am proud of, so to be criticised for three years totally with those results I find quite hard to take to be honest. "Support and positivity is what this England team needs. The crowd at Lord's were brilliant and a bit more support like that will stand everyone in good stead."